About a week ago I was shopping at a local thrift store and found a good sized metal water bottle. This was good, except for the water bottle being branded, and I prefer to not have visible brands on my stuff. I covered the bottle with strips of white hockey tape, with as little overlap as I could. 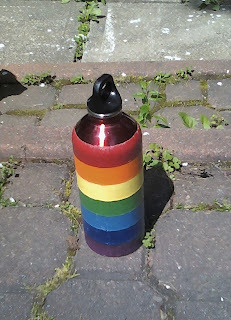 Then I painted the bottle with acrylic paint, freehand, trying my best to color each strip one color. Finally I glossed it with some of the gloss that my sister uses to make her masks shiny, though this step was not even really necessary. I am happy with how the water bottle looks now, and it holds a pleasing amount of water, some time in the future I will actually measure how much water that is.